Graphite is one of the two common but distinctively different forms or allotropes of carbon, the other being diamond. Graphite holds the distinction of being the most stable form of solid carbon ever discovered. It may be considered the highest grade of coal, just above anthracite, although it is not normally used as fuel because it is hard to ignite. Unlike diamond, graphite is an electrical conductor. It can therefore be used, for instance, as the material in the electrodes of an electrical arc lamp. Also unlike diamond, graphite is fairly soft and is used as the "lead" in "lead pencils." The term "graphite" is sometimes also used to refer to carbon fiber or carbon fiber reinforced plastic. Graphite was given its name by Abraham Gottlob Werner in 1789, from the Greek word γραφειν (graphein), which means "to draw or write." He selected the word based on the use of this allotrope in pencils. Associated minerals with which graphite commonly occurs include: quartz, calcite, micas, iron meteorites, and tourmalines. In 2005, China was the top producer of graphite with about 80 percent of the world share followed by India and Brazil. Other characteristics: thin flakes of graphite are flexible but inelastic; the mineral can leave black marks on hands and paper; it conducts electricity; and it displays superlubricity. Best field indicators are softness, luster, density and streak. Some time prior to 1565 (some sources say as early as 1500), an enormous deposit of graphite was discovered at the site of Seathwaite Fell near Borrowdale, Cumbria, England. The locals found that it was very useful for marking sheep. This particular deposit of graphite was extremely pure and solid, and it could easily be sawn into sticks. This was and remains the only deposit of graphite ever found in this solid form. Each carbon atom is covalently bonded to three other surrounding carbon atoms. The flat sheets of carbon atoms are bonded into hexagonal structures. These exist in layers, which are not covalently connected to the surrounding layers. 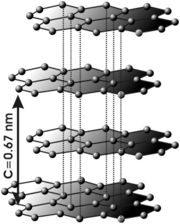 Instead, different layers are connected together by weak forces called van der Waals forces much like those of mica. The unit cell dimensions are a = b = 2.456 ångströms = 245.6 picometers, c = 6.694 Å = 669.4 pm. The carbon-carbon bond length in the bulk form is 1.418 Å (141.8 pm), and the interlayer spacing is c/2 = 3.347 Å (334.7 pm). Each carbon atom possesses a sp² orbital hybridisation. The pi orbital electrons delocalized across the hexagonal atomic sheets of carbon contribute to graphite's conductivity. In an oriented piece of graphite, conductivity parallel to these sheets is greater than that perpendicular to these sheets. The bond between the atoms within a layer is stronger than the bond of diamond, but the force between two layers of graphite is weak. Therefore, layers of it can slip over each other making it soft. The acoustic and thermal properties of graphite are highly anisotropic, since phonons propagate very quickly along the tightly-bound planes, but are slower to travel from one plane to another. Graphite can conduct electricity due to the vast electron delocalization within the carbon layers. These electrons are free to move, so are able to conduct electricity. However, the electricity is only conducted within the plane of the layers. Graphite and graphite powder, is valued for industrial applications, for its self-lubricating and dry lubricating properties. There is a common belief that graphite's lubricating properties are solely due to the loose interlamellar coupling between sheets in the structure. However, it has been shown that in a vacuum environment (such as in technologies for use in space), graphite is a very poor lubricant. This observation led to the discovery that the lubrication is due to the presence of fluids between the layers, such as air and water, which are naturally adsorbed from the environment. This molecular property is unlike other layered, dry lubricants such as molybdenum disulfide. Recent studies suggest that an effect called superlubricity can also account for graphite's lubricating properties. The use of graphite is limited by its tendency to facilitate pitting corrosion in some stainless steels, and to promote galvanic corrosion between dissimilar metals (due to its electrical conductivity). It is also corrosive to aluminum in the presence of moisture. For this reason, the US Air Force banned its use as a lubricant in aluminum aircraft, and discouraged its use in aluminum-containing automatic weapons. Even graphite pencil marks on aluminum parts may facilitate corrosion. Another high-temperature lubricant, hexagonal boron nitride, has the same molecular structure as graphite. It is sometimes called white graphite, due to its similar properties. When a large number of crystallographic defects bind these planes together, graphite loses its lubrication properties and becomes what is known as pyrolytic carbon. This material is useful for blood-contacting implants such as prosthetic heart valves. It is also highly diamagnetic, thus it will float in mid-air above a strong magnet. Graphite forms intercalation compounds with some metals and small molecules. In these compounds, the host molecule or atom gets "sandwiched" between the graphite layers, resulting in compounds with variable stoichiometry. A prominent example of an intercalation compound is potassium graphite, denoted by the formula KC8. Graphite is the substance used as the marking material ("lead") in common pencils. 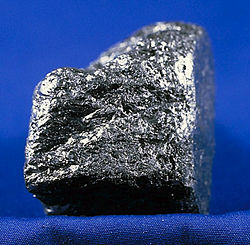 Closely related to graphite are the pure glassy (isotropic) synthetic forms, pyrolytic carbon and carbon fiber, which are extremely strong, heat-resistant (to 3000°C) materials, used in reentry shields for missile nosecones, solid rocket engines, pebble bed reactors, brake shoes, electric motor brushes, and as electrodes in electrical discharge machines (EDM). Intumescent or expandable graphites are used in firestops, particularly plastic pipes and gaskets, fitted around the perimeter of a fire door. During a fire, the graphite expands and chars to resist fire penetration and reduce the likelihood of the spread of fire and fumes. A typical start expansion temperature (SET) is between 150 and 300 degrees Celsius. Graphite also finds use as a matrix and neutron moderator within nuclear reactors. Its low neutron cross section also recommends it for use in proposed fusion reactors. Care must be taken that reactor-grade graphite is free of neutron absorbing materials such as boron, widely used as the seed electrode in commercial graphite deposition systems—this caused the failure of the Germans' World War II graphite-based nuclear reactors. Since they could not isolate they were forced to use far more expensive heavy water moderators. Graphite used for nuclear reactors is often referred to as Nuclear Graphite. Graphite has been used in at least three radar absorbent materials. It was mixed with rubber in Sumpf and Schornsteinfeger, which were used on U-boat snorkels to reduce their radar cross section. It was also used in tiles on early F-117 Nighthawks. One industrial form of processing the mineral graphite is through the milling process. In that process graphite is ground to a fine powder for use as a slurry in oil drilling; in zirconium silicate, sodium silicate and isopropyl alcohol coatings for foundry molds; and for calcium petroleum coke, which is used as a recarbonizer in the steel industry (Earth Metrics, 1989). Rough graphite is typically ground and packaged at a graphite mill; often the more complex formulations are also mixed and packaged at the mill facility. Environmental impacts from graphite mills consist of air pollution including fine particulate exposure of workers and also soil contamination from powder spillages leading to heavy metals contaminations of soil. Dust masks are normally worn by workers during the production process to avoid worker exposure to the fine airborne graphite and zircon silicate. Rotating graphite stereogram. (2.79 MB, animated GIF format). Problems seeing the videos? Media help. ↑ Pencil. Retrieved November 28, 2007. ↑ Better Lubricants than Graphite Retrieved November 28, 2007. ↑ Weapons Lubricant in the Desert. Retrieved November 28, 2007. ↑ Good Engineering Practice: Corrosion. Retrieved November 28, 2007. ↑ about.com:tennisWhat is the best material for a tennis racquet?Retrieved November 30, 2007. Hogan, C. Michael, Marc Papineau, et al. 1989. Phase I Environmental Site Assessment, Asbury Graphite Mill, 2426-2500 Kirkham Street, Oakland, California. Earth Metrics report 10292.001. This page was last modified on 11 July 2017, at 19:33.